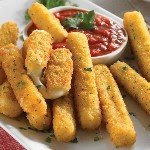 Frugal & Fabulous: 25 cent Mozzerella sticks! Update 7/26: This coupon is actually for the larger size but it worked for me! YMMV, let me know if it works for you! Woohoo! Use this coupon to get 75 cents off any Farm Rich product. (It'll let you print two). Sorry to say that I've started to get spam-like messages. So all comments are now annonymous. Sorry!